Devorah Steinberg is a Licensed Clinical Independent Social Worker from Jamaica Plain, MA specializing in couples counseling, depression, mind/body connection, and spirituality. Her practice is integrative, combining traditional talk therapy with other techniques including hypnotherapy, Reiki, yoga, and EMDR. 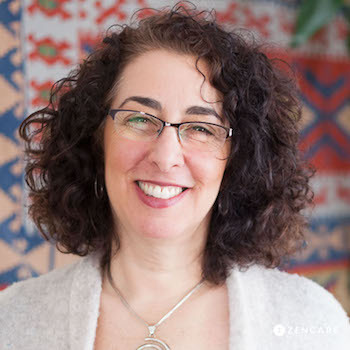 Devorah centers her sessions on discussing clients’ personal life goals and spiritual connections. She underscores the connection between the mind and body, describing the body as a root, and cognition as its branches. She and her clients explore the deeper causes of standing emotional burdens, focusing on spirituality and overall well being. Mindfulness – Incorporating techniques like meditation and breathing to reduce negative thought patterns. Spirituality – Exploring topics about higher power or connection to the universe. Mind/Body connection –Using behavioral, psychological, social, expressive, and spiritual approaches to strengthen the relationship between mind and body. Devorah is not in network with any insurances. Sliding scale: A sliding scale of $150 - $165 is offered to clients who need a reduced fee to receive therapy. Therapist's note: Devorah can provide you with paperwork for reimbursement from your insurance company if you are seeking out-of-network sessions. "Are you ready to have the life you desire in health, wellness, relationships and spirituality, to align with your truth values and connect with your life purpose? My unique integrative therapy and life coaching approaches will help you leave behind your difficulties and challenges and create lasting contentment by accessing the fullest capacity of your mind, body, heart and spirit. It takes courage to acknowledge that changes are necessary and that you can’t do it alone. I am dedicated to guiding you with compassion, wisdom, warmth and a sense of humor. Individuals and couples welcome." Integrative Therapy (IPT)Integrative therapy is a progressive form of psychotherapy that combines different therapeutic tools and approaches to fit the needs of the individual client. Devorah and I have worked together for over 12 years. She helped me to be truly honest with myself and with others. Through that, I have learned to make better decisions, to be a better spouse, friend and family member. If you are interested in exploring who you are as a person and growing to be a better version of yourself, Devorah will help you get there. It isn’t until you truly understand yourself that you can let yourself heal and grow.